Wymering Manor Trust Shortlisted for the People’s Millions 2013!!! Our “Mind Your Manor” project has been shortlisted as part of the Big Lottery Fund and ITV’s People’s Millions Fund. The project plan is to renovate and refurbish the music room, kitchen and chapel areas of the Manor to be used as a community hub for local events and activities as well as a learning centre for training and volunteering opportunities. We will be looking to involve the community in the project from the outset and are already working in partnership with the University of Portsmouth and Highbury College on the design of the scheme will continue to do so as the project develops. We could receive up to £50,000 to make this happen, BUT, we need votes! Check our Website, Facebook or Twitter pages or the Daily Mirror on Tuesday November 26th to get the phone number to place your vote! The number will only be given to us on the 26th and the lines to place your vote will only be open between 9am and midnight. On Tuesday 26th a short film about “Mind Your Manor” will be broadcast on Meridian News highlighting in detail all that we aim to achieve for both the Manor and Local Community. 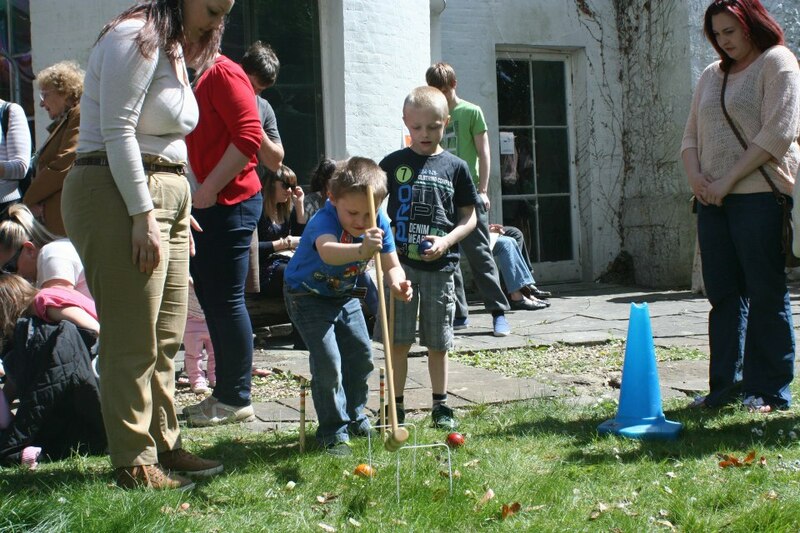 Everything from essential repairs to make the Manor safe for community use and providing disabled access to the Victorian Wing to the provision of gardening equipment for our volunteer gardeners, and computer equipment for training programmes. We need as many votes as possible to be in with a chance to win an award and you can call up to 10 times to vote for us! Here is the link to our project page on The People’s Millions site for more information. The Trustees, Friends of old Wymering and Graham Healey got together to clear the garden. The weather was dreadful but this didn’t hamper our clearing efforts! Instead we made great headway with the inside of the Manor in preparation of the Halloween Ghost Walks. Wymering Manor Trust were delighted to host Bill Fergie and Edward Roberts at the manor on 11th October. Edward and Bill were met at the house by Andrew Mason from WMT and Dr. Karen Fielder from the University of Portsmouth. Edward and Bill are both leading heritage professionals and the foremost authorities on domestic architecture within Hampshire. Their involvement at the manor has seen them produce a hugely valuable report into the nature of construction of the Elizabethan house and drawings of the newly exposed timber frame of the building following the structural failure in the north corner. On their most recent visit, Bill and Edward examined the large chimney stack at the rear of the hall and considered whether its construction is likely to date from the time that the house was built or whether it could perhaps be from an earlier structure on the site. Edward quickly concluded that the stack fits very well with the period that the timber frame was raised; however, elements of its construction suggest that the stones forming the plinth and quoins have been re-used from an earlier building. We hope to welcome Edward and Bill back to the house before too long and are most grateful to them for taking the time to visit and for the benefit of their expertise. The South East region of the UK Association of Preservation Trusts held their annual meeting on 18th October at Wymering Manor. The event was hosted by Judith Martin of The Industrial Buildings Preservation Trust and Dr. Celia Clark of Wymering Manor Trust. Over twenty delegates were in attendance, including Ian Rice from the Architectural Heritage Fund and Dr. James Moir, director of the UKAPT. Guy Stanford from Tennyson Insurance in Chichester led a useful discussion on the problems faced by those seeking to insurance heritage assets and was able to provide valuable advice to a number of the trusts present. 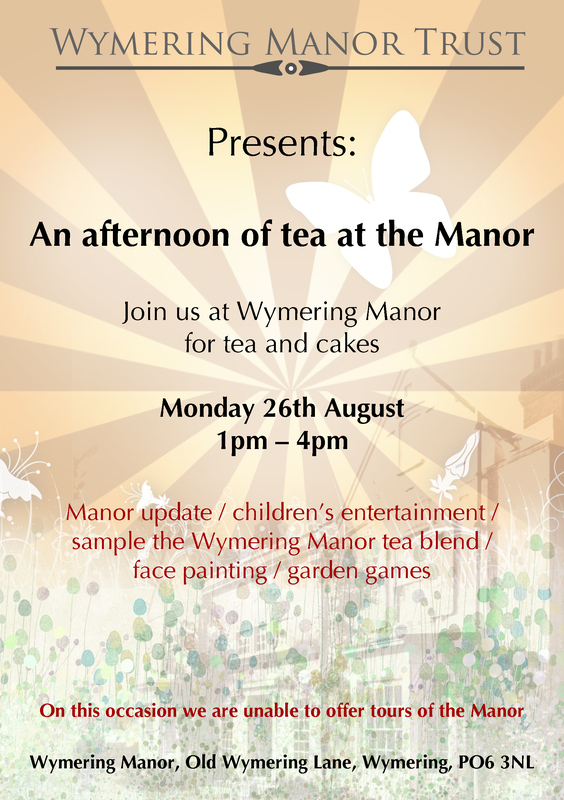 Family Fun Day at Wymering Manor.